Lempira is the currency of the Latin American country of Honduras. It is divided into 100 centavos and is known as HNL under the international currencies code. It is symbolized by L.
The Honduran lempira was introduced in 1931. It replaced the peso which was the official currency at that time. In 1931, 5, 20 and 50 centavos coins and 1 lempira coins were minted and distributed for circulation. In 1932, 10 centavos was introduced. In 1935, 1 centavo was added and in 1939, 2 centavos were in circulation. Until 1937, the 1 lempira coins were minted in silver. They were replaced with cupro-nickel lempira coins in 1967 as well as with 20 and 50 centavos coins. Current coins in general circulation are 5, 10, 20 and 50-centavo coins. The first Honduran lempira banknotes of 1, 2, 5, 10 and 20 denominations were introduced in 1932. In 1950, the Bank of Honduras took over the production of lempira bills. The bank introduced 50 lempiras banknotes in 1951. In 1975, 100 lempiras were added into general circulation, and in 1995, 500 lempiras were made. In January 2010, a new milestone was reached when 20 lempira notes made from polymer base were introduced. The Honduran lempiras bear the images of some of the country’s most prominent historical figures, the most notable of which is Lempira himself on 1 lempira banknotes. Lempira was a 16th-century ruler of the indigenous Lencas who led his people’s resistance against the Spanish conquistadores. The 2-lempira coin features Marco Aurelio Soto, who is a former president of the country. The 5-lempira has Francisco Morazan, the hero of Battle of La Trinidad. Former president Jose Trinidad Cabañas is featured on the 10 lempira coin. Honduran liberal leader Dionisio de Herrera has his portrait on 20 lempira bills while Juan Manual Galvez, another former president has his own portrait on every 50-lempira. 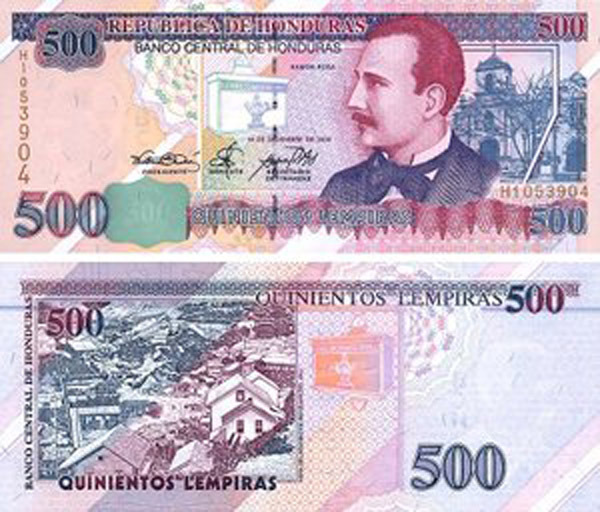 Jose Cecilio del Valle, popularly known as “The Wise”, is featured on the one hundred lempira; while biographer Ramon Rosa is featured on all 500 lempira notes. All of the lempira banknotes measure 156 x 67 mm. The current exchange rate of US dollar to lempira is 18.92 lempiras per US dollar.